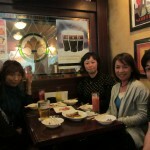 Tomtom Kinshicho English Pub Night! 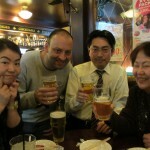 Mina, Andy, Ryugo and Uchiyama-san enjoy Friday night beers. Beer plus English = happy! 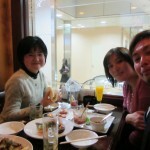 We had cocktails as well as beer…..
We also found time to eat some food…..
Our Canadian guest tells students how he likes Japan. 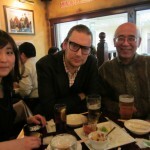 Josh and Kazuo compete for the “Best Glasses” prize. Who do you think is the winner? Sometimes it’s best to sit in the corner….